Hello, gentle readers, and greetings from Georgia, USA. Today marks one year of being back in the United States, and I have to say that this past year has been an incredible year of discovery and changes. Some good, some challenging, and all part of the adventure that was waiting for me when I returned from Spain. However, if you keep reading this post, I have some exciting news to share! Got that? If you assume that there are about 20 workdays per month, I have been on the road 8.3 months out of the last 12, and even with the occasional day at home and vacation, you can tell that my time at home has been severely limited. 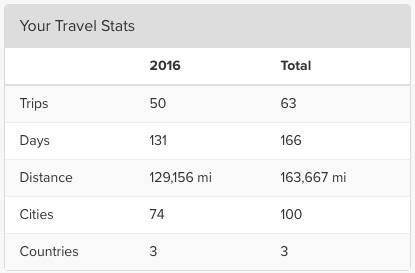 Probably the most misleading statistic is the number of trips, because there are often multiple segments in a single trip. It was not unusual to have five nights in five different hotels, often in five different cities. My schedule was to give a presentation in the morning, go the airport, fly to the next city, give a presentation in the morning, fly to the next city… and eventually end up back at home. To be honest, I have missed the time with family and friends dreadfully. Considering that it has been almost three years since I left for Spain to start a new life abroad, it stings even worse when I don’t have the luxury of social connections when I returned back to the US because I am traveling all the time. I am very happy for the time I have been able to spend with friends, but I know I need more time to build connections with those I love. That’s why I am extremely excited about some new changes in my job that are quickly working their ways into my schedule! I recently accepted a temporary (“on special assignment”) role to support the international components of our business. While this may not seem like a big deal, I am very excited because I will be traveling in more concentrated periods of time. I will go a single place and stay in that one place for more than one night, instead of leapfrogging from one hotel in one city to another. Additionally, I will be working more at home in the non-travel cycles, making social time with friends a reality again. For you, my gentle readers, I will be reconnecting with you through this blog, and hopefully bringing you along with me as I have more adventures in the US and abroad. Stay tuned! What an exciting change! If you get a chance to come to/ through Raleigh, NC, please let me know! Would love to see you and catch up. Been. a long time since I’ve seen you! I promted your name last weekend in a meeting about our relationship. Hope all is well despite the travel. God Bless. Yes, I would like to get together sometime! Sounds exciting!!! Keep me posted! I will, and I hope that we can meet up sometime for a coffee and chat! Miss you! YAYY!!!!!!!!!!!! I’m excited that I will get to see you more, especially spending so much more time in Statesboro!! I’m so excited for you for your new position, and can’t wait to see you. Love love love!!!!!! I was glad to see you at Aneli’s wedding! Hopefully there will room for some margaritas in our schedules sometime soon. Heck, yeah! That sounds like a definite opportunity to socialize! I’ll try to reach out in the near future and we can see what our schedules hold! I’ve missed you so much! Please let me know when you have a moment to breathe! So glad to see that you are doing well and that your schedule will calm soon! Miss you! Miss you, too! I hope that we can reconnect! So happy to hear about this new opportunity. When can we meet for brunch again?? We will figure that out soon! Great news! I am happy for you. Let’s get together during one of your “non-travel” cycles! You better believe it! We will definitely catch up! Miss you and when I get home I hope we catch up!!!! Congrats on your special assignment! I look forward to hearing more about your adventures! Thanks! I hope we can catch up in person sometime! So excited for you. Miss catching up with you and look forward to what’s to come. Here’s to more great adventures to be shared. Absolutely! I would love to catch up sometime! Congratulations! Can’t wait to hear more! Yes… there will be more coming out in future posts! Great news for you … sounds much more realistic – look forward to reading more – and who knows, hopefully our paths will cross again ‘ real soon’ !!! I thought I had responded to this blog but I guess I didn’t! I know how exhausting it is go be in one hotel after another all of the time. Would love to see you. Looks like everyone else wants to see you, too! Be in touch when this would work for you. Miss you! …want to get together!